When do I Aerate My Lawn? Soil compaction in Knoxville is a primary cause of an unhealthy lawn. Aerating can help relieve soil compaction, and spring is an excellent time to do it. It reduces compaction from regular mowing and traffic such as lawn games. It opens up space to allow air to get to the roots. Less compacted soil drains better. Grass plants are better able to utilize water and nutrients. 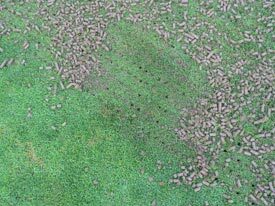 Regular aeration also reduces buildup of thatch—a layer of dead roots, leaves and stems. Up to a half-inch of thatch is good because it provides a cushion and some protection to the roots. However, heavier thatch buildup reduces water and nutrient absorption and can smother the roots. Soil compaction is a common cause of a struggling lawn. If your grass receives heavy traffic, it will best survive that use if aerated once or twice a year. A heavy clay soil also needs more frequent aerating. Lawns receiving light traffic or established on a sandy soil can be aerated once a year or every other year. If you live in the south and have warm season grass such as Bermuda and Zoysia, it’s an excellent time to aerate. These grasses are most actively growing in the late spring and early summer. Cool-season grasses such as bluegrass, ryegrass and fescues (Most common in Knoxville) grow most actively in the fall and spring, and aerification is best done then. However, if soil is especially compacted, early aerating in summer is fine. Furthermore, if your lawn has thinned out due to winter damage or disease, aerating before seeding and fertilizing will help your lawn thicken up more quickly. Core aerating — using a machine that removes plugs of soil — is the easiest way to aerate. Hand aerators are available, but in most cases, a machine is much easier and will do a better job. These aerators can be rented at some garden centers and most rental stores but are very tough to maneuver. The soil should be moist but not wet when you aerate. A sandy soil should be watered lightly the day before aeration. A heavy clay soil should be watered about two days before. To ensure complete aerification, it is best to go across the lawn twice: once east to west, and once north to south. The “cores,” or plugs, left behind by the aerator can be removed, but don’t need to be. In a couple of weeks, they will break up with weather and traffic. If you want to speed up the process, drag a mat across the lawn to break up the cores. Unless you are going to remove the cores, it is best to do your aerating a couple of weeks before a family get-together or planning yard games. Planning on aerating your lawn? In Knoxville Aeration is very important when needed. Contact us for a quick meeting to weigh pros and cons as to how aerification will impact YOUR lawn. Aerating your lawn is a very important cultural practice. This guide will give you the skinny on how, when, and why to do it!